You, dear friends and family, know that the word “macrobiotic” makes me itch. It is only slightly higher than the bottom-rung words “raw food” and slightly below “vegan” in my hierarchy of words that describe things I want to eat. I love quinoa, I love those Heritage Flakes made by Nature’s Path made of “ancient grains,” even as I’m tittering at my cereal box, but amaranth is, in the U.S., the province of people who need gluten-free foods, and although I would never sneer at other’s misfortune, I’ve never felt a need to share in their misfortune. So I’d never tasted amaranth beyond what was put into the aforementioned Heritage Flakes until last Monday. And now I’m eating amaranth until it comes out of my ears. ¿Por que? It’s my volunteer job to cook it, play with it, and of course, taste it. It’s the best volunteer, nonpaid job I’ve ever had, even more evidence that the gods are smiling on me. Amaranth, or amaranto en espanol, is one of those forgotten plants that seem to promise everything. It has incredibly high amounts of protein, calcium, and other essential nutrients, much more than corn, and these nutrients manifest themselves in a form more easily digestible and absorbable than in other foods. When combined with corn or other grains, it even forms a complete protein. 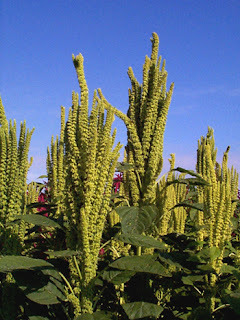 It’s native to Mexico and Latin America, but amaranth was significant in religious rituals for indigenous peoples here, and so was stamped out by the Spanish. Puente’s work in community health in rural Oaxaca therefore has a simple, straightforward message: eat more amaranth. They’re working with farmers to grow it, especially since it commands four times the price of corn, and they work with women in the communities to develop new recipes incorporating amaranth into their diet. Malnutrition in Oaxaca is more the result of a lack of variety in the diet rather than a straightforward lack of food; in fact, obesity and diabetes are leading causes of death here. Although the organization has already developed a fair number of recipes using amaranth flour, amaranth leaves, and puffed amaranth, which is usually sold in Oaxaca in honey-amaranth bars called “alegrias,” meaning “joys,” but they haven’t done much experimenting yet with the seed or grain itself. So everyday, I think about what typical foods in the pueblos could incorporate some amaranth grain without being too strange, without requiring foreign or expensive ingredients. That means most American hippie-gluten-averse-health-nut recipes are out, and even a fair number of ingredients that I think of as Mexican but aren’t really available to poor rural Oaxacans, like cheese or tomatillos or chicken. In any case, since this is my first time actually trying to create recipes, it’s a relief not to have the whole world at my disposal. They don’t expect me to perfect recipes, just to see what works and perhaps more important, what absolutely doesn’t work, before they encourage the women in their communities to experiment themselves. So I started by just cooking amaranth straight, trying to understand what basic properties it had, what basic flavor it had, and thinking about how it would complement the flavors in existing rural Mexican food. The moment I tasted my first mouthful, I learned something very elemental: wash it first. It was so embarrassing to eat gritty, gummy amaranth, even standing alone in the kitchen. One of the best things about this job is that I’m forced to get over my fear of cooking really basic Mexican food. I thought amaranth, even when gummy, would taste pretty good mixed up with nopales, or cactus, and diced tomato, lime juice, and cilantro, like the salad I’d been served when I visited a community with the executive director a month ago. So I went out and bought cactus paddles, already de-spined and cleaned, at the Gigante grocery store in the neighborhood. Most Mexican recipes for nopales don’t even bother telling you how to cook it, they just say, “Cook the nopales and then…” So I had to Google some English-language recipes. Although Rick Bayless says they’re best when grilled, I thought I should cook it in the way they would most likely be cooked in the pueblos and boiled them with some water and salt for 15 minutes, until tender. I rinsed them carefully to minimize their slimy tendency and was surprised to find they had a tart, bright flavor of their own, separate from the lime juice and cilantro I was ready to add. Nopales are usually sort of slimy anyway, and the gumminess of the amaranth wasn’t too weird in combination. This was successful enough that a couple of Puente staff had it for lunch with salsa and tostadas. But most exciting of all, I’m being forced to make tortillas from scratch! Tortillas, tamales, and atole all come from the same base, dried corn kernels that are boiled with limestone to remove the tough outer husks and then ground very finely and combined with water to make a dough for tortillas or tamales, or added to boiling water and sometimes chocolate to make a filling hot drink, like champurrado. Puente would love to know if a handful can just be thrown into the pot to make masa. My first attempt was okay, tasty the way a whole-wheat, crunchy piece of bread can be tasty, just not tortilla-like at all. I had another pot sitting overnight, so we’ll see what happens today with a different ratio of corn to amaranth.